Order wisely! 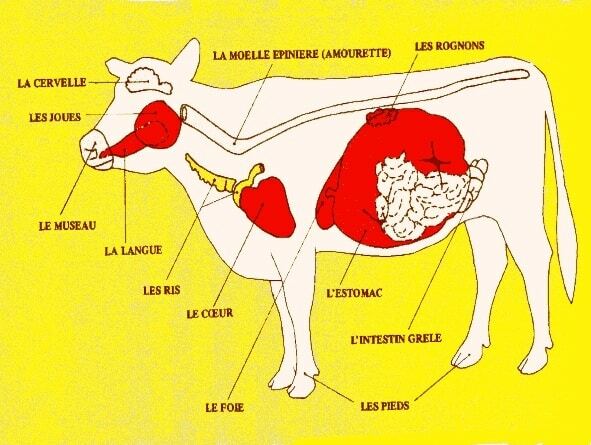 Learn everything about offal in French: the French organ meat vocabulary, as well as widespread French dishes that feature variety meat. Tripes, chicken hearts, brains… one of my students’ biggest fears when going to France is ordering one of these variety meats, or organ meats (referring to the internal organs and entrails of animals). As disgusting as this may sound to some, many of these meats are considered a delicacy, and are indeed common in French cuisine. Offal (organ and variety meats) are called “les abats” (pronounced “lé zaba”) in French. Most French people would not even consider “le foie” as an ofall when used in charcuterie. “les os” – the bones (used in savoury jelly). Des ris de veau, prepared by my Mom… I love it, but it’s VERY rich. Now I’m not going to list dishes that have any of the above words in them: they are easy to spot. 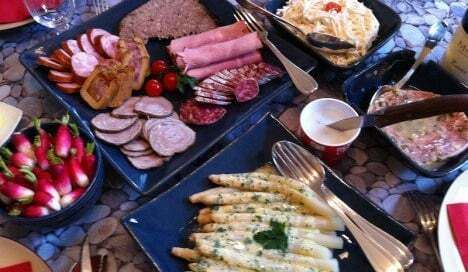 I’ll list common French offal dishes whose names are ambiguous. Beware of local specialties which might not be listed here: always ask what is in them. As you will be happy to see, only a few dishes have names that don’t reveal their content… most of the time, once you know the words listed above, you’re safe. “la farce” (stuffing): It is very common in France to add liver to the stuffing of birds and other dishes. “l’andouillette” (warm) et “l’andouille” (cold) : stomach sausage, they both have a very, very strong taste. “le fromage de tête” – has the word tête but I thought it was worth mentioning since the word “fromage” can really be misleading. It’s a pâté made with head meat. “le vol-au-vent”, also called bouchée à la reine or timbale financière : the best ones may have “ris de veau” inside, and they used to have chicken crests. “la gelée” – most commonly made with bones and blood, but there are also many alternatives to make “gelée” including vegetal ones. “La potée” – A common cabbage, potatoes and meat dish. In the really traditional version, it includes “pied de porc” (pig’s feet) but you’ll probably only find it if you eat it at someone’s home or in a VERY traditional restaurant. In the “charcuterie” world (see my post about French charcuterie), you are pretty likely to run into some use of offal, so if you don’t want to risk it, stay away from all pâtés, terrines, sausages, cold cuts unless you know exactly what you are ordering. Many French people don’t like “les abats”, and usually, the French are aware that foreigners may not be OK with them as well. So it’s unlikely someone would serve you “des tripes” at home on your first meal with them. However, “un paté” with some grounded liver in it would be very common and most French people would not consider that as organ meat since it’s so common in French cuisine. Try it! You will probably not notice it at all. However, if you really don’t want to eat offal, say: “je ne désire pas manger d’abats (pronounce it “daba”)” and if this includes liver, add: “même pas de foie s’il vous plaît” (not even liver please).